Almost 500 Primary 7 school pupils from Greater Belfast attended Flash! Bang! Wallop! a fun lecture recently hosted as as part of the Step-Up programme Engaging Young Minds. The interactive lecture was delivered by Professor Peter Edwards and Mr. Peter Hollamby from the School of Chemistry at Cardiff University. Pupils were treated to a variety of colourful and impressive demonstrations which showed that science can be interesting and stimulating. Engaging Young Minds is an innovative programme of interactive lessons, games, competitions and experiments, delivered by the Department of Access and Educational Partnership, which is supported by funding from the University’s Access Agreement and the Department for Employment and Learning. 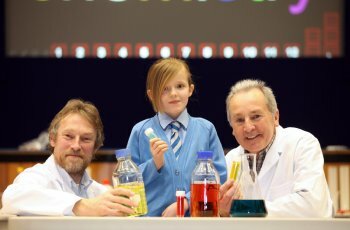 CAPTION: Professor Peter Edwards (left) and Peter Hollamby with Star of the Sea Primary School pupil Jennifer McTasney.